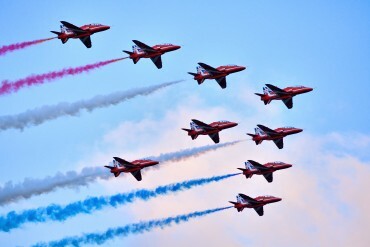 The Clacton Air Show will take place this year on Thursday 24th and Friday 25th August on Clacton sea front . This will be the 26th year of the Clacton Air Show and the two day event will feature impressive aerobatic displays plus, on the West Greensward area, exhibition stands, on site entertainment and a food court. Evening flights will take place on Thursday 24th which will be followed by a fireworks display at Clacton Pier. This year Thompson Smith and Puxon (TSP) will sponsoring the Clacton Air Show Car Park Appeal organised by the Rotary Club of Clacton on Sea. The idea of the scheme is to offer guaranteed parking close to the air show with all funds raised going to local charities. Last year the car park scheme raised over £15,000 for local charities. The car parks are all manned by Rotary members and TSP Solicitor Sarah White will be joining them as a volunteer this year. You can find out more about the scheme and book your parking here.